When I discovered Kideo I got excited because my children have just loved to receive personalized books, CD’s and clothes in the past but I had never seen a personalized DVD before. Then I started to browse through the selection of titles you can choose from and flipped over the personalized Spiderman DVD. My five year old son literally wore his Spiderman costume for two weeks straight only allowing me to sneak in and wash it while he was sleeping. I just knew that this would be a hit. 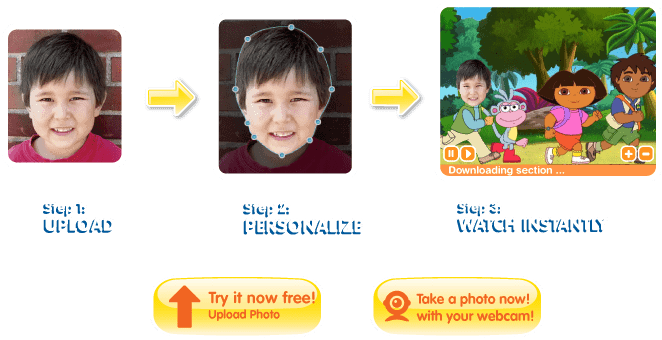 It is very easy to create your Kideo featured DVD as you just simply choose your character, upload a photo of your child, crop and align it to fit and add your child’s name for the character. When our Kideo Spiderman DVD arrived, I settled the family in front of the T.V. in order to surprise them and their faces were absolutely priceless. My son’s eyes were HUGE and the two little ones started jumping up and down screaming with delight, “Adam that is you…..YOU are Spiderman!” I admit that I was blown away with how creatively the Kideo video incorporates your child right into the action as the main character. It was a nice length too so you really get your monies worth when you purchase a Kideo video. My family (grandparents, aunts and uncles) were visiting when I first played this for the kids and they couldn’t stop commenting about how original and fun it is to watch. You can choose from a variety of exciting cartoons including Dora, Diego, Barney, Precious Moments, Care Bears and more. The Dora video “Whose Birthday is it?” would be a hit at any young child’s birthday party. In fact, any Kideo video would make a fantastic keepsake for a special occasion including birthdays, Easter baskets, Valentine’s Day etc. Kideo has excellent customer service in my experience. I had a question which was addressed almost immediately and I was left very satisfied. You can choose from several purchasing options which makes this such an affordable gift idea for any budget. In fact you can even send the gift now with NO photo needed! I voted for Simply Stacie on Picket Fence Blogs 1/31. I voted for you at picket fence blogs on 1/31. I voted for you at picket fence blogs on 2/1. I voted for you at picket fence blogs on 2/2. I voted for you at picket fence blogs on 2/3. I voted for you at picket fence blogs on 2/4. Dora is her favorite character, Would love to win th Dora, Diego and Me! I voted for you at picket fence blogs on 2/5. Dora is My favorite character!